Solomon enunciated the principle, “God creates one thing opposite another” (Ecclesiastes 7:14), which means that God always balances things out. When evil arises in the world a corresponding good arrives with it. This was the situation beginning in the decades just before the Common Era. At the same time that the murderous madman Herod came to power God gave to the Jewish people a man whose goodness offset – more than offset — his evil. That man was Hillel. In the discussion we will have of early Christianity we will see that much of the personality that the early Jewish-Christians used to describe their founder is really borrowed from the personality of Hillel. They did so to try to gain a certain amount of acceptance among the Jewish people. In any event, Hillel was the gentlest, kindest and most patient of people. His influence is felt throughout the world until today. The Talmud sometimes refers to him as “Hillel the Babylonian,” which refers to the fact that he came from Babylon originally. While war, chaos and turmoil reigned in Judea the Jewish Babylonian community was relatively stable, tranquil and churning out great Torah scholars. Hillel was one of them. Hillel actually came twice to Judea. The first was in his youth and he studied in the Academy of Shamaya and Avtalyon, who were converts (or descendants of converts). He left Judea when Herod came to power, as did many Torah scholars whom he persecuted horrifically. Most departed for Egypt or Babylonia. Hillel returned to his home in Babylon. It is not known exactly when and under what circumstances he returned to Judea the second time. Whenever it was, this time Hillel returned as a fully developed scholar, albeit someone whose stature was unknown at first (see Pesachim 66a). Hillel was descended from the House of David. The House of Hillel, in fact, will rule longer than the House of David, a total of more than 400 years. From Hillel’s time onward, for 15 consecutive generations, the “Prince” — the leader of the Jewish people – would be a direct descendant of Hillel. With Hillel the leadership of the people passed out of the hands of the Hasmoneans — who were priests (i.e. descendants of Aaron the Levite) — back to the House of David, the tribe of Judah, as the Torah prescribed (Genesis 49:10) and previous generations of Pharisees had tried to implement. Until the time of Hillel, the leading scholars often had political and even military clout, and believed it their duty to exert it, taking the king and government on head-on. Hillel decided that that approach would not work with a madman like Herod. It would only lead to a bloodbath. So Hillel withdrew from the fray. He said, in effect, that the task of the sages was to build the Jewish world from within. Herod and Romans would not prevail anyway in the long run. One of Hillel’s famous aphorisms was uttered one day when he saw a skull floating on the water: “Because you drowned [i.e. murdered], you were drowned, and in the end those who drowned you will be drowned” (Pirkei Avos 2:7). In the broader sense, that really was Hillel’s national policy. History exacts its own retribution. Evil will not stand forever. Eventually it will fall. Therefore, we need not confront it head on. We need not destroy the Jewish people while we are trying to save the Jewish people. If Herod will afford us the freedom to develop our own unique, Jewish spiritual life, then we need not oppose him openly. That was a new departure. Herod never quite figured out that Hillel had outfoxed him. Hillel had gained the love and respect of the people – a love and respect that Herod never had, and that he desperately wished to have. In effect, Hillel had built up a parallel system of government that co-existed with Herod’s. And the Jewish people were more loyal to the “Kingdom” of Hillel than they were to the Kingdom of Herod. Shamai was Hillel’s contemporary. Whereas Hillel was born in Babylon and poor, Shamai was born in Judea and wealthy. More than that, Shamai had a completely different personality than Hillel. Nevertheless, with their diametrically opposite styles, together Hillel and Shamai steered the Jewish people through one of its most troubling periods — and it was more than troubling in just an outward, political sense. Until the time of Hillel and Shamai, Jewish law was always agreed upon; differences of opinion were settled by the Sanhedrin. Nevertheless, from the time of Hillel and Shamai onward the strain on the Jewish people and their educational system were so great that new, monumental disputes in many areas arose among the Jewish intellectual leadership. Hillel and Shamai had a minimum amount of legal disagreements between themselves; only three, in fact. However, each founded his own renowned academy of Torah learning and there arose numerous and contentious disagreements (312 to be precise) among the disciples. Eventually, it went beyond the mere number of disputes and became almost two diametrically opposed viewpoints. There is a danger to oversimplify this, but generally the Academy of Shamai is thought to be stringent where the Academy of Hillel tends to be lenient. Generally, the Academy of Shamai looks at the potential whereas the Academy of Hillel looks at the actual. There are many theories advanced in the Jewish authorities throughout the centuries attempting to explain the central core of their disputes. The greatness of the Academies of Shamai and Hillel is that despite their serious differences they married between themselves, ate by each other and generally behaved as one people. There was a difference in education and outlook, but not in lifestyle. That was the key. In the world of the Torah scholars, a meritocracy and democracy prevailed. Their differences were eventually decided democratically by majority vote and the Talmud concluded that the law follows the opinion of the Academy of Hillel (with few exceptions). The turbulence in the Jewish world at the time of the rise of Herod paralleled in many ways the turbulence in the Roman world. As people in the Jewish world turned more and more to the world of the spirit, the Roman world, too, experienced a type of soul searching that, first, manifested as disillusionment with paganism, and, then a wide-spread interest in Judaism. The Jewish population in the world at the beginning of the reign of Herod was approximately four to six million. A century later, after the destruction of the Temple, there were almost ten million Jews, representing an enormous increase. The reason was not simply related to an increased birth rate, but that hundreds of thousands – if not millions – converted to Judaism. It was a time of mass conversion in the Roman world. Roman historians wrote that approximately one out of every ten people in the Roman Empire was Jewish. Today, Jews are about an eighth of one percent of the world population. One can imagine the influence Jews had when they were ten percent. The main reason is simple: Roman paganism began to break down. It was a victim of its own success. The Romans had developed their own culture with their own provincial ways. As their empire expanded they came into contact with a great and wide world. Suddenly, belief in all of their superstitions and fairy tales began to seem petty and empty. People who were enlightened enough to impose the Pax Romana (“Roman Peace”) on the world suddenly found it very hard to swallow their own religion. The Jews held almost a fatal attraction for the Romans. Much of the Roman upper class converted to Judaism. If the Jews would have waived the requirement of circumcision who knows how many Romans would have become Jewish. Later, Paul — one of the leaders of early Christianity — would capitalize on that to win adherents to his new religion. In effect, Paul told them that they could have all the benefits of Judaism without any of the pain and liability. The Talmud discusses how non-Jews came to Hillel seeking conversion with outlandish conditions. 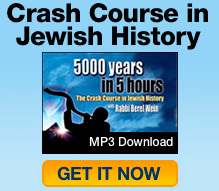 Nevertheless, Hillel found ways of convincing them to convert. That does not mean he converted people at random or without requirements. But, it demonstrates how it was a time of mass conversion. Even more remarkable is that it happened despite the fact that Judaism is not a proselytizing religion; it does not go out and look for non-Jews to become Jewish. Nevertheless, this was an exceptional period that lasted 100 to 150 years in which the Jewish population perhaps doubled. That was mainly because of converts. Many Jewish commentators attribute it to the fact that Hillel himself had been a student of converts (Shamaya and Avtalyon) and was thus partial to converts. Hillel’s support of his teachers – his constant quoting of them and attributing his knowledge to them – strengthened this movement of converts throughout the Jewish people. In either event, this infusion of outside blood in such a relatively short period of time remains one of the unique phenomena of Jewish history. In times of terrible crisis, God provides singular people who enable the Jewish people to survive. Hillel was such a person. He arrived as a counter-balance to the madman Herod. His strength of character and nobility of spirit was the inspiration of the Jewish people not only of his generation, but of Jews even today 2,000 years later. It was Hillel, not Herod, who reestablished the true Kingdom of the Jews, which is the Kingdom of Torah, of goodness and kindness. The Talmud (Shabbos) mentions 18 exceptions. According to other estimates, there were three or four million Jews in the century before the destruction and six million afterward.